The W260051L1 is Cartier's Tank Americaine series model with the elegant expression of time in solid 18 karat white gold. This wristwatch is a gorgeous statement of luxury and sophistication. This Cartier watch features a a scratch-resistant sapphire crystal with anti-reflective coating, an 18-karat white gold octagonal crown, set with a faceted spinel sapphire stone, accents the case. The petite elongated rectangular case curves gently to fit the contours of the wrist and presents on a beautiful 18-karat white gold link bracelet. 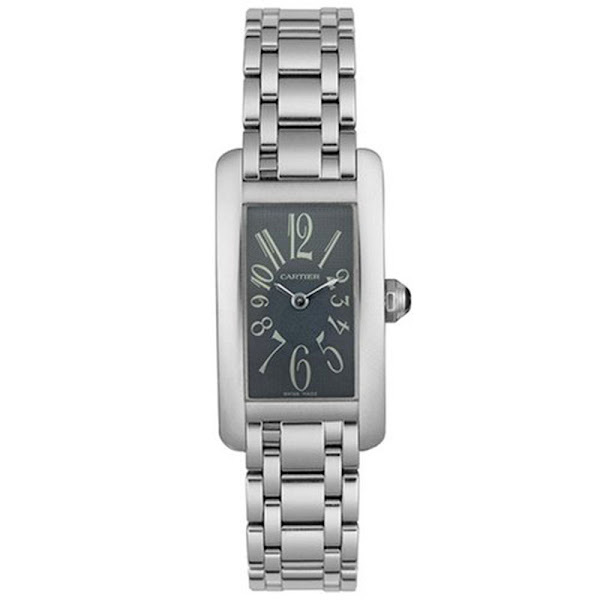 This adorable timepiece begins with a square 19mm of 18k-white-gold case. Furthermore, this timepiece has two small sword hands and large stylized Arabic numerals are featured against a dark grey dial. This luxury timepiece with a signature Cartier aesthetic offers Swiss quartz precision. Finally, this watch boasts water resistance up to 99 feet. This Cartier Tank Americaine's original price is $15,300. You can find an original Cartier W260051L1 Watch at the site(s) listed above. However, we don’t guarantee its availability as being listed here simply means that those site(s) has the item in question by the time we wrote the review.